Can 19 Types of Plants Clean Some of America’s Dirtiest Water? Brooklyn’s Gowanus Canal, known as one of the dirtiest waterways in America, a place where scientists sampling the water once found gonorrhea in the murk, is currently playing host to something a bit prettier. A new “floating island” was launched recently in the canal in an attempt to clean the water. Landscape architect and urban designer Diana Balmori calls the project “GrowOnUS,” and the island includes 19 plant species living in metal culvert pipes filled with plastic bottles. Fast Company reports the structure is layered with bamboo, woody plant material, water hyacinth rope, shredded plastic, coconut matting and oak cork. The structure should act as a sponge that will filter the water, distilling it and collecting it into a reservoir underneath. Balmori and the Gowanus Canal Conservancy received a $20,000 grant to make the project a reality. “We think of this as being a productive farm that could serve to feed into farmers’ markets and into restaurants,” Balmori told Fast Company. Perhaps the Gowanus Canal should be viewed more as a proving ground than a gross pool. 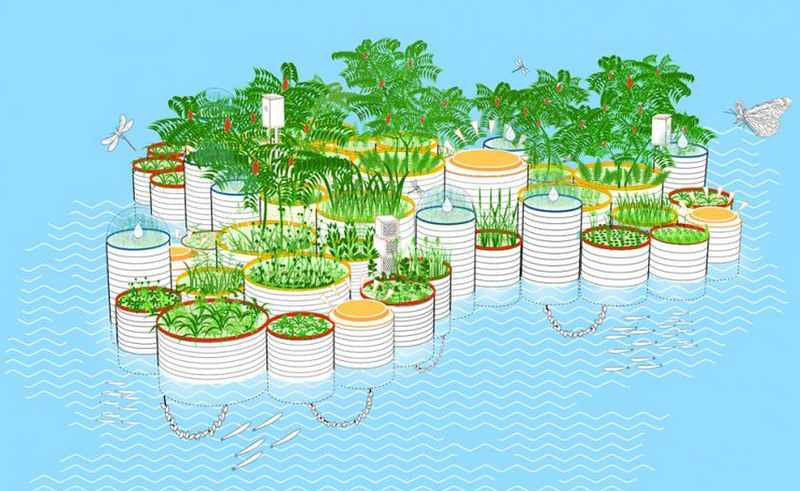 After all, the floating island isn’t the first fascinating de-polluting solution that’s been proposed. “We picked the hardest,” Balmori told the Wall Street Journal. In other words, if this works there, it could probably work anywhere.